As a pediatrician I make it part of my personal continuing education goals to keep up with the latest in children’s entertainment. Big Hero 6, Disney’s latest animated feature film, did not disappoint. 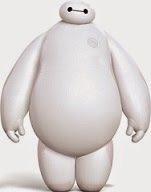 It introduced me to Baymax, a potential future health care colleague I can look up to. Baymax was inspired by a Big Hero 6 co-director’s visit to a Carnegie Mellon robotics lab that was exploring soft safe robots and developing inflatable arms to help feed, groom, and dress nursing home residents or the elderly.